Gum Disease - Mark T. Albers, D.D.S. Periodontal disease, or gum disease, affects the tissue surrounding your teeth. The earliest stage of gum disease, gingivitis, presents as swollen or red gums that bleed when teeth are cleaned. If left untreated, gingivitis can progress to periodontal disease, a condition where the gums may pull away from the teeth, bone may be lost in the jaw, and teeth can become loose and fall out. We encourage regular cleaning appointments and provide information about proper home care so that we can hopefully prevent gum disease before it happens. If a patient shows signs of gum disease, especially in the early stages, there are several treatments we offer which can improve overall gum health and prevent the condition from worsening. Our first line of treatment for your gums involves regularly scheduled dental cleaning appointments and instruction in good home care. Patients at our office receive yearly periodontal assessments and we chart the results so we can monitor any gum issues over time. 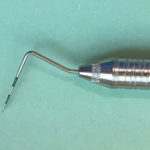 We use a periodontal probe to measure the depth of the pocket around each tooth. The Mouth Healthy article referenced above includes a short but very informative video on periodontal screenings which illustrates what happens during a periodontal screening. Measurements of 1-3 mm are considered normal. In addition to flossing, which helps remove plaque between teeth, we encourage our patients to use a perio-aide. Perio aids have two ends with toothpicks that are used to clean along the gum line. We provide instruction to our patients on how to use them. Measurements between 4-12 mm indicate some degree of gum disease, with the higher number correlating with more advanced gum disease. When patients have pockets 4-6 mm, we typically recommend more frequent cleanings and in some cases, a deep cleaning procedure called root planning and scaling. Because the gum pockets around the teeth are deeper, bacteria have more area to multiply and cleanings need to be more aggressive. Because these treatments can be uncomfortable for patients, we oftentimes anesthetize the area so that our hygienists can clean the teeth throughly. When periodontal charting reveals pockets over 6 mm, we recommend that patients be seen by a specialist in gum disease called a periodontist. Staying on top of gum disease is important so that teeth are not lost. Of course, we prefer to prevent gum disease in the first place and highly encourage patients to keep up with regular preventive care. Prevention is key!